…some meters were being checked time and time again! A meter on South 9th Street was tested at 11 a.m. one morning and approved, then hours later it was tested again, and approved again!Then there is the situation we found on Ridge Avenue, a meter was tested and approved eight times last year, and it happened in other places too! Please do not try to argue any of this with the PPA, though as they do “…not receive meter inspection reports from the City, and has no idea which have been certified as required by law.” If you’ve ever seen Parking Wars, you know it’s best to move on and take it to the judge if you want to fight. Three letters, four dudes – they are a band from the majestic city of Providence, Rhode Island. Four Brown University graduates, not afraid to tell you straight up that buddy, a violin is cool. The violinist is Spencer Swain, one of the front men for Zox. Swain is to Zox what Tom Morello is/was to Rage Against the Machine, a genre-defying, rule-bending juggernaut of musical ingenuity. Much like Morello’s guitar work for Rage, Swain’s amazing violin work tends to save songs that otherwise could be a shade on the boring side. A conservatory-trained performer, Swain dances violin lines through a complex system of pedals and distortion and delays, providing much needed edge – some ominous clouds descending on a pleasant summer day. Zox is a pop band- an update on that feel good, bouncing Police-sound of the late seventies, the melodramatic lyrics of the eighties, and the angst and brawn of the nineties. Lead singer and guitarist Eli Miller sings about love, losing love, having love, getting over love, and ultimately trying to forget love. He sings songs about old friends and the loneliness of the road, where Zox have tirelessly made a name for themselves over the past six years. Prior to signing to the California independent label, SideOneDummy, home of bands such as Flogging Molly, the Mighty Mighty Bosstones, and Gogol Bordello, Zox made diligent work of the East Coast college scene. Their live show got the word out, then the word of mouth sold the records, and now the band has released their third album, Line in the Sand. John Zox, the band’s drummer, drives the band in both name and style. His drumming calls to mind the manic madness of the Police’s Stewart Copeland, typified by sharp, quick cymbal hits, rapid hi-hat work, and one-droppin’ rim shots. Along with bassist Dan Edinburg, Zox creates the kind of quirky, popping atmospheric foundation that allows room for both Swain and Miller to dance along the surface. What Zox is, is a band that ultimately sounds like something, but nothing you have ever heard before. Yes it’s somewhat about the presence of the violin, but it’s also much more than that. There is a distinction to Zox, a distinction that separates the band from all the other MySpace Road Warriors out there now, prowling up and down 95 in shabby vans pulling shabby trailers to play shows with shabby equipment. There’s probably a band out there right now called Shabby for all we know! But it doesn’t matter anymore because all these bands are now just hopeful and potential openers for the Zox Machine. Zox seemingly had it all figured out as the band pounded pavement up to the doors of nearly every college and university on the East Coast. The college circuit is the Grail for an upcoming band –the winning ticket if you can pull it off. 1.) Have at least half of your band be talented. 2.) The other half should be either mildly talented, charismatic, or some combination of both. 3.) Listen to Sublime, some Johnny Cash, maybe a little early Metallica, and for kicks, the Clash. 4.) Start playing as many shows as possible – talk to friends, talk to bands, talk to anyone who will listen and when you do, give those monkeys a demo! Don’t take no. This is war! 5.) Play shows like each one is the very last one you’ll ever play before you lose your arm in some freak wood-working accident or drunken roller derby. 6.) Liberally toss in a great cover song, like the Pixies Where is my Mind or the Beatles Helter Skelter. 7.) And then just go, go, go baby and don’t stop until the sun comes up! So for a couple years that is what Zox did, all while crafting increasingly more complicated and appealing tunes and running wild – armed with a clipboard of e-mail addresses and free stickers for anyone who would add theirs. It’s nothing that hadn’t been done before and won’t be done by hundreds of bands this weekend. But for Zox it worked, it worked well and soon it worked well enough to get the boys signed, to get them on the Warped Tour and MTV, and to get touring not just the States, but also England and various other hot spot destinations around Europe. It worked so well, that now Zox doesn’t have to tell people that a violin is cool. All they have to tell anyone is where they’re playing that night – the rest seems to be working itself out just fine. Zox, www.zoxband.com, play World Café Live tonight, Tuesday March 11th. The show is upstairs and starts at 9pm. Army of Me, an accoustic duo, open the show. Both the Obama and Clinton headquarters opened in Philadelphia today, and Chelsea Clinton will be working for her mom on Penn campus. At 4:30 PM she’ll host an event called “Our Voice, Our Future” at Wynn Commons, 3417 Spruce Street.The Clintons have quite a bit of work to do. My general impression is Philadelphia is an Obama county. Certainly, it’s to the point where within a certain age range it’s not at all cool to support anyone else.Although I only work two doors down from this afternoon’s event, I much prefer to catch a timely train home rather than try to squish myself in with the collegiate crowds. If it were Hillary herself, sure. I’m sure Chelsea is a good speaker, but all I’d want to know from her is why she ditched Socks when they left the White House. You are going to lose an hour, tick! tock! Be warned! This coming Saturday night (Sunday morning, technically) is the “spring ahead” part of Daylight Saving Time. Don’t forget that you lose an hour of partying, I mean sleep, on Sunday morning. According to my source (a website), President Bush signed the Energy Policy Act of 2005, which made us start switching the clocks in 2007 on the second Sunday in March and the Second Sunday in November. I know Arizona doesn’t care – they never switch their clocks, nor do sections of Indiana, Hawaii, American Samoa, Guam, Puerto Rico, nor the Virgin Islands. And don’t forget to check the batteries in your smoke detector! 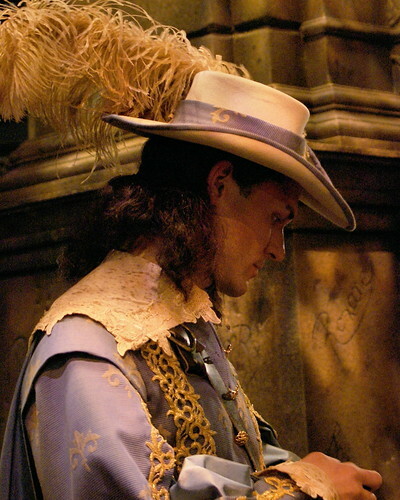 Cyrano performer, originally uploaded by moocatmoocat. Yesterday, the Opera Company hosted an open-house and backstage tours, including lots of photos ops and a chance to meet some performers. 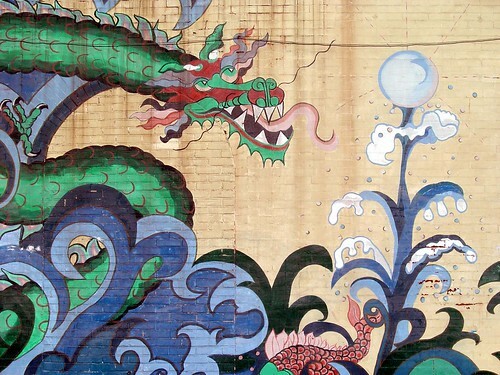 Chinatown – Philadelphia, originally uploaded by truman216a. I love the retro mood of this photo of Chinatown. 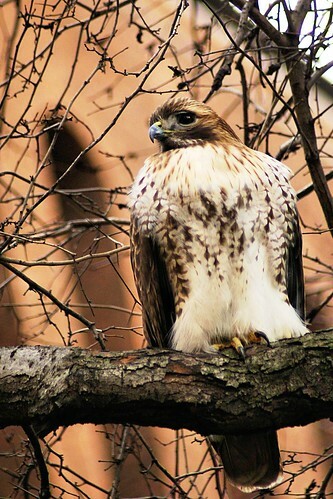 City Hawk, originally uploaded by moocatmoocat. This red-tailed hawk apparently is auditioning for the job of Thomas Jefferson Medical College mascot. He’s been hanging out around 11th and Walnut for some time now, reducing the local pigeon population. Friendly Dragon, originally uploaded by Adamina. Happy Chinese New Year! (and happy Ash Wednesday, too…two holidays in one!). door patterns and textures, originally uploaded by moocatmoocat. love the craftsmanship on this richly textured door on Church Street in Old City. 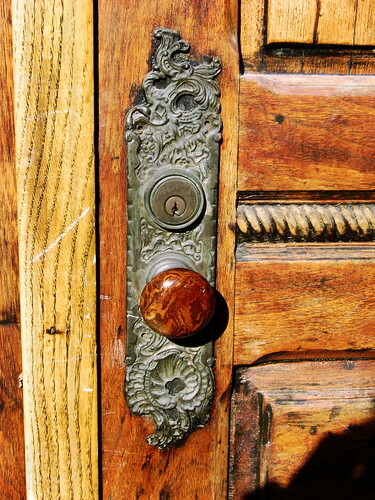 Great wood grain complements the intricately patterned door plate.